FreedomPop, the freemium Sprint MVNO, has officially launched some plans aimed at small business owners. 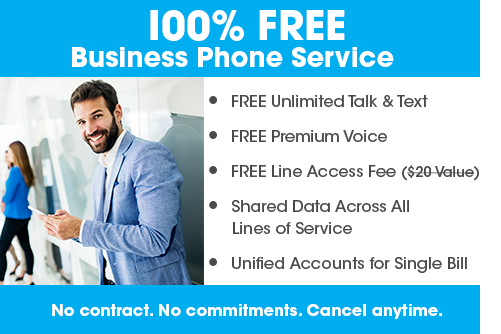 The business phone service, much like the personal plans, have a 100% free tier. From there, users can upgrade to get more data for a fee. FreedomPop, a freemium Sprint MVNO, has made some pretty big changes in the last few months. Just last month, it launched a self-branded smartphone, and added a prepaid phone marketplace late last year. Now, it looks like the company has officially launched its first ever family plan. 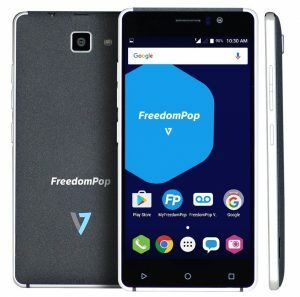 FreedomPop, a freemium Sprint MVNO, has launched its first self-branded smartphone, the FreedomPop V7. This device is currently only available in the United Kingdom and Spain, but is expected to be launched in the United States sometime soon. Today, we’ll look at Scratch Wireless, and FreedomPop. Both are Wifi-first companies and, at the time of writing, Scratch recently reorganized its business structure. 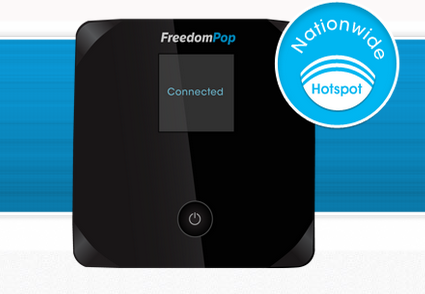 FreedomPop, by comparison, has been around for a couple years. Today, we’ll look at Ting, a T-Mobile and Sprint MVNO, and FreedomPop, which operates using Sprint and AT&T’s network. Since both companies operate using a CDMA and GSM carrier, I thought it would be a good match-up. More and more, we seem to be seeing MVNOs which offer ‘freemium’ plans that upsell consumers to spend money for additional service. One of the first and more popular of those is FreedomPop, which previously operated via Wifi and on Sprint’s nationwide network. However, the company recently launched a new AT&T service to compliment the Sprint offerings. While prepaid phone plans are easily half the cost of a typical contract plan, actually purchasing the phone outright is required. This upfront cost is what stops many users from taking advantage of all of the benefits of a prepaid phone plan. While many places like Amazon offer used phones, it’s hard to know what to get. However, it looks like FreedomPop is trying to make that jump just a little easier. FreedomPop, a Sprint MVNO, is the first mobile service company in the US to offer a zero rated WhatsApp Service. Together, FreedomPop and WhatsApp will provide data, texts, and calls to consumers for free through WhatsApp. This premier zero rated plan is not only available in the US, but also in 30 other countries worldwide. In April, Sprint confirmed that it would be shutting down its WiMAX network in the first week of November. While Sprint’s WiMAX network didn’t really have all that much coverage or widespread adoption (mostly due to the painfully slow roll out and the emergence of LTE), there are still some MVNOs and phones circulating that use this network. Today, we’ll look at Sprint MVNOs RingPlus, and FreedomPop, both of which offer free services with premium upgrades and wifi options. If you have the freemium Sprint MVNO FreedomPop and are in the market for an external battery for your smartphone, then this deal is probably right up your alley. For a limited time (and with limited quantities) FreedomPop is offering customers a deal on one-time free data package along with the purchase of an external battery. For nearly a year, Sprint freemium provider FreedomPop has been undergoing various merger and acquisition talks with several different companies. And, despite multiple promises for a decision before the holidays, shortly after the holidays, and then earlier this spring, FreedomPop CEO Stephen Stokols has finally announced on the company blog that FreedomPop will not be merging with or selling to any other companies and that he had raised $30 million in funding to continue to expand the company. 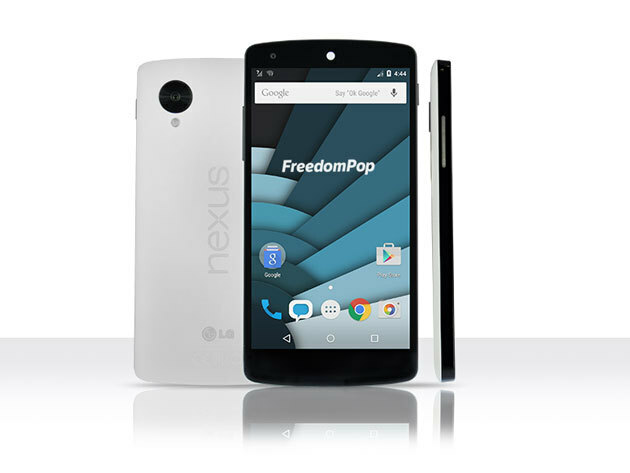 FreedomPop and 9to5toys have banded together to offer consumers a pretty sweet deal. I’m not sure when this promotion ends—presumably when supplies run out—but for a limited time, 9to5toys is selling a Nexus 5 and one year of subscription to FreedomPop services for $200. FreedomPop Wireless has launched a new Premium Voice Technology today that will provide customers with a better quality call and fewer dropped calls. Similar to companies like Republic Wireless, FreedomPop’s premium voice technology will allow phones to switch seamlessly between VoIP and traditional carrier networks, based on which has better service and signal in a given area. 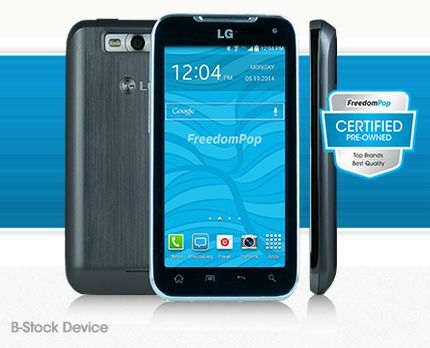 FreedomPop announced a deal last week which I completely missed. Originally stated to be “today only” the deal is apparently still viable, as I was able to get quite a ways through the checkout screen with no difficulty. However, if you’re interested in taking advantage of this deal, I would urge you to do it sooner rather than later. FreedomPop is the nearly undisputed king of cheap phone service, offering free minutes, text and data to its customers every month, with additional services available for a small monthly fee. Well, yesterday, this Sprint-powered MVNO has added yet another affordable feature to help every have access to wireless: wifi only service for $5. FreedomPop had some pretty sweet holiday deals this year, and they are expected to end tomorrow, Jan 31. So if you’re looking for a new device for a pretty sweet price, or a shiny new mobile hotspot device, then you should definitely consider taking advantage of this offer. FreedomPop had three different offerings for Black Friday shoppers, and those deals (which were advertised as one day only) have been extended to Cyber Monday, or until they run out of stock. The website still says “Black Friday! Today Only!” pretty much everywhere, but I checked and the offers are still available. Guess they’re too lazy to change the website. Sprint MVNO FreedomPop Wireless announced this week that they will be offering free international calling to draw additional customers to their network. As of yesterday, all customers who download the FreedomPop Free Talk and Text app for Android and iOS will get 100 free minutes of international calls each month to around 50 countries. The service is expected to be expanded to more than 100 countries in the next few weeks. Countries currently available include Mexico, the UK, Canada, China, Brazil and India among others. To get these free minutes, customers do not have to have a FreedomPop phone or FreedomPop service, but you do need to register an account. I just received an email from FreedomPop for a 24-hour promotion. Right now, they are currently giving away free refurbished USB modems (normally priced at $80) to select areas along with free shipping and 2 GB of data, plus premier data services for the first month–all for free. If you’ve ever wanted to try out FreedomPop, this would be a fantastic opportunity. 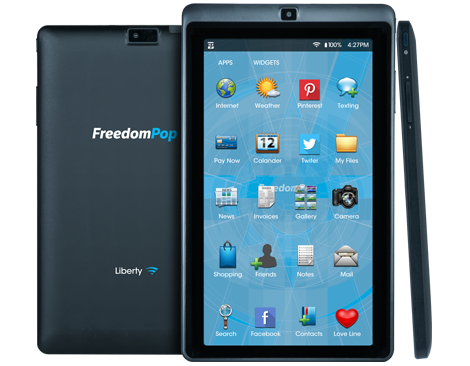 The new FreedomPop Liberty. It’s a tablet! No, it’s a phablet! No, it’s…. both? FreedomPop will be celebrating it’s two-year anniversary this month with the release of a slew of new devices available this month and the next. Among those devices are two self-branded phablets (or maybe one is a tablet…we’re not really sure), a new upcoming Android LTE phone, and the release of the popular Samsung Galaxy Note 2 and Note 3 for a fraction of the normal retail. You might remember at the end of August, we reported that FreedomPop was in talks with an unnamed major carrier about a possible acquisition of the internet-based telecom company. However, today it was announced that a second company that is not tier 1 has engaged in formal M&A talks with FreedomPop as well. Neither company has been named yet, as FreedomPop is still considering options. Nearly a month after the merger talks between Sprint and T-Mobile concluded, Sprint MVNO FreedomPop is undergoing formal talks with an undisclosed ‘major carrier’ over a possible acquisition of the MVNO. Fierce Wireless reported yesterday that FreedomPop CEO Stephen Stokols had confirmed the acquisition talks, but declined to provide details other than that FreedomPop was seriously considering the offer. In the early days of this blog we often wrote about a free MVNO called Blyk. While they were in the UK and we focus on the YS market, their model was just too intriguing. Instead of charging customers, they served them ads. That allowed customers to get a certain level of free service — just talk and text back then — every month. The service shuttered in 2009, but it had served hundreds of thousands of customers during its time in business. There is now an American MVNO trying for a similar free effect, but they’re going about it in a completely different manner.